Originally published on the Presbyterian Mission site here. LOUISVILLE — On the Tuesday after Thanksgiving, the Presbyterian Church (U.S.A.) will once again participate in a celebration of giving that is observed around the globe. #GivingTuesday, which this year falls on Nov. 27, is described by its organizers as “a global day of giving that harnesses the collective power of individuals, communities and organizations to encourage philanthropy and to celebrate generosity worldwide.” Following the widely recognized shopping events of Black Friday and Cyber Monday, #GivingTuesday presents an opportunity to kick off the giving season by inspiring people to collaborate and give back. Within the PC(USA), opportunities to make a #GivingTuesday gift will range from the national level to congregations. A Presbyterian #GivingTuesday webpage offers several giving options for Presbyterian Mission Agency ministries and other PC(USA) causes. The PMA giving opportunities include the “greatest need,” Compassion Peace & Justice, Public Witness and Advocacy, World Mission, Young Adult Volunteers, the Christmas Joy Offering, the Presbyterian Giving Catalog, the Presbyterian Hunger Program, 1001 New Worshiping Communities, Presbyterian Disaster Assistance, and Racial Equity and Women’s Intercultural Ministries. In addition, the webpage also invites gifts for Presbyterian Women, the Presbyterian Foundation, the Presbyterian Historical Society and Hands and Feet, a ministry of the Office of the General Assembly. For congregations interested in receiving #GivingTuesday gifts, the Presbyterian Foundation has developed resources to help them participate. #GivingTuesday was founded in 2012 by the 92nd Street Y, a community and cultural center in New York City. #GivingTuesday encompasses a broad range of organizations, including many faith-based groups, and last year the movement reached into more than 150 countries. The PC(USA) began participating in #GivingTuesday four years ago. The Rev. 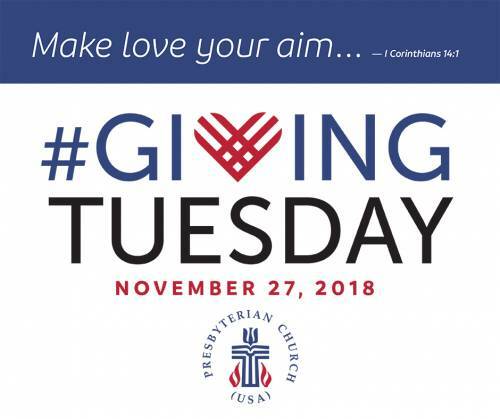 Dr. Diane Moffett, president and executive director of the Presbyterian Mission Agency, said #GivingTuesday offers Presbyterians an opportunity to reset their focus after Black Friday and Cyber Monday and give from the spirit of gratitude that was celebrated on Thanksgiving Day. “#Giving Tuesday also comes just days before the beginning of Advent, the season when we celebrate the coming of the Christ Child, the greatest gift of all,” Moffett said. This entry was posted in PC(USA), Stewardship on November 15, 2018 .